For the town in Quezon Province, see Tayabas. 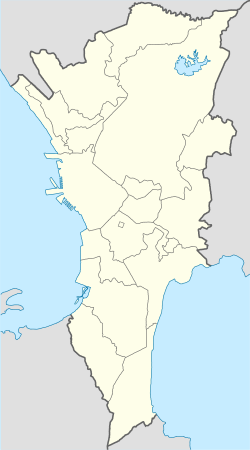 Payatas is a barangay located in the 2nd district of Quezon City, Metro Manila, Philippines. Nearby barangays are Commonwealth, Batasan Hills and Bagong Silangan. The name Payatas derived from the word "payat sa taas” (lit. thin at the top), which means the soil located in the upper part of Tullahan River is not good for planting rice. It is divided into three local government areas called barangays in the Philippines. They are known simply as the Payatas A, B, C.
Barangay 8 is the original name of Payatas. Payatas is the only barangay established under judiciary rule. Located northeast of Quezon City, Barangay Payatas occupies a little less than twenty percent (20%) of the city’s land area and has about fifteen percent (15%) of the city’s total population. These figures are hotly disputed by academic surveys, however, given that Payatas is far more densely populated than the rest of Quezon City and much of Manila. The Census says there are just under 120,000 people living in Barangay Payatas, though academic studies suggest the real figure, given that most people are squatters are therefore do not own the land they're living on and are not included in official figures, is closer to 500,000 (Gaillard and Cadag, 2009; Bernardo, 2004; among others). Payatas shares a border with La Mesa Dam to the north, Barangay Bagong Silangan to the east, Barangay Batasan Hills to the south, and Barangay Commonwealth to the west (see Map 1). Until today, about a third of the land in various parts of Payatas is being claimed in disputes between the municipalities of Montalban and San Mateo, as well as the barangays of Commonwealth and Fairview. Payatas is characterized by a steep and sloping terrain, crisscrossed by creeks, rivers, ravines, and low-lying areas near the Marikina River. A fault line runs through its eastern boundary. 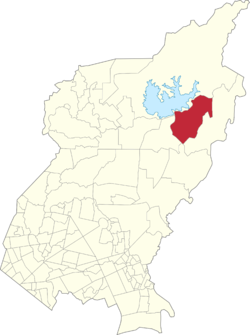 A large part of the area is classified as medium residential zone that includes housing subdivisions, depressed or informal settlements, and undeveloped areas. Covering a total land area of 774 hectares, a greater portion of Payatas is privately owned (681 ha, or 88%; see Chart 1). Government-owned land, which includes the four-hectare national government complex (NGC) and the Quezon City property, covers a smaller portion (12%; 93 hectares) of the total land area. While portions of the privately owned area were already developed into residential subdivisions, a vast area (80%) has yet to be fully developed. Nonetheless, despite the poor access and lack of services and facilities, these areas continue to attract a large number of informal settlers from various areas of Metro Manila. Around the 1970s, upon the initiative of a former barangay official, Barangay Payatas was divided into two major settlement clusters (Area A and Area B) to organize the route of public vehicles. Each area, with its large population and land area, was further subdivided to allow for easier information dissemination and reporting to and from the barangay (see Table 1 below). The larger Area B is further subdivided into Groups 1 to 13 and Phases I to IV in Lupang Pangako, consisting of around 5,000 families where the poorest of the poor are located. A distinguishing feature of Payatas is the Payatas Dumpsite, a 13 hectare garbage dumpsite in Area B. In the 1970s, the area was merely a ravine that was surrounded by farming villages and rice paddies. 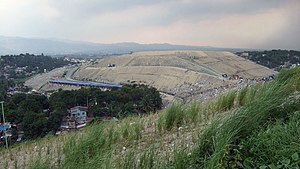 Now, Payatas houses a 50-acre landfill which earns it the names "second Smokey Mountain", "21st Century Smokey Mountain", "new smokey Mountain", or "modern-day Smokey Mountain" due to scavengers migrating from the original Tondo landfill in 1995 after the latter's closure. A landslide of junk on July 10, 2000, killed 218 people living on the dumpsite and caused 300 missing persons, though many first hand accounts note that the number is far greater and much closer to 1,000. Payatas dumpsite is still the largest open dumpsite in the Philippines and was reopened only months after the 2000 disaster at the request of scavengers and other residents of the area who depend on it for their livelihood. There has been some good progress at the dumpsite since the landslide of 2000, as the dumpsite has been resloped to a 40 degree angle from its original 70 degree angle while children under the age of 14 have been banned from the dumpsite and methane extractors remove the methane and convert it into electricity, preventing the spontaneous fires which used to characterise it. Payatas is still a very poor area and many foundations operate in Payatas to help improve the opportunities of residents. This includes, notably, Puso Ng Ama (PNA) and the Fairplay For All Foundation. Fairplay run an Alternative Learning Center, a Sports Center, and a Cafe to holistically develop the community through social enterprise, safe spaces, and quality education. Each program is run in part by local residents. Several of the football players have also represented the country in the National Youth Team and for Team Philippines in the Street Child World Cup. Overall, Payatas Football Club has won more than 40 trophies between them. ^ "Quezon City Barangays". The Local Government of Quezon City. Retrieved 22 May 2013. ^ Donohoe, Martin (2012). Public Health and Social Justice Volume 31 of Public Health/Vulnerable Populations. John Wiley & Sons. p. 41. ISBN 9781118223093. ^ Leon-Guerrero, Anna (2010). Social problems: community, policy, and social action (3rd ed.). Thousand Oaks, Calif.: Pine Forge Press. p. 413. ISBN 1412988055. ^ (Habitat), United Nations Centre for Human Settlements (2001). Cities in a globalizing world (1. publ. in the UK and USA. ed.). London [u.a. ]: Earthscan. p. xxvi. ISBN 1853838063.